WHAT gender is the voice of God? Even now movie trailers and promos largely hew to a template created 40 years ago by Don LaFontaine, Hollywood’s most prolific voice-over artist. Possessor of a resonant baritone that could cut through tight sequences of music and sound bites — and the coiner of familiar (and parodied) phrases like “In a world ...” and “One man, one destiny” — LaFontaine, who died in 2008, voiced more than 5,000 trailers, thousand upon thousand of commercials and television promos. In the past few years, as audiences have grown more sophisticated, the independent production companies that make trailers for Hollywood studios have begun moving away from voice-overs, favoring graphic devices like title cards to serve as narration. “As much as possible people are trying to let the movie speak for itself, without being as heavy handed as the ‘voice of God’ narrator feels,” said John Long of Buddha Jones Trailers, which was responsible for campaigns for “Kung Fu Panda 2” and “Inglourious Basterds,” among others. 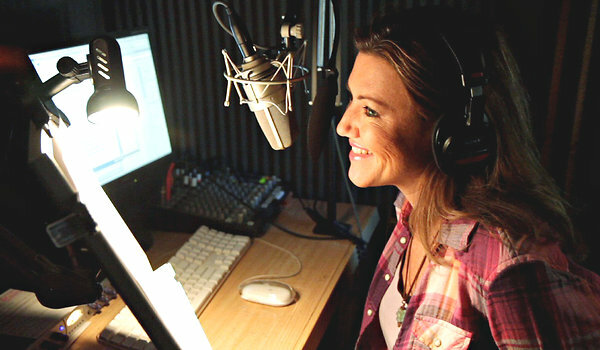 Still, plenty of voice-over jobs remain, especially in television, though women are seldom cast. “There are some very talented, very gifted women in this business that can satisfy any request for a narrator, but the opportunities aren’t given to them,” said Mike Soliday, a talent agent who represents prominent male voice artists like Scott Rummell and Tony Rodgers. Do moviegoers want to hear female voices? Research indicates that our brains are wired to prefer theirs to male ones; that’s the reason robotic voices, like those in GPS devices, tend to be female. (This probably has an evolutionary explanation: fetuses in the womb, identifying with their caretaker, can distinguish their mother’s voice from others, a study published in the journal Psychological Science found.) When it comes to credibility, however, research into the perceived believability of a voice — an important quality for the omniscient narrator of a trailer, as well as the spokesman or -woman for any product, which is the function a trailer serves — tells a different story.